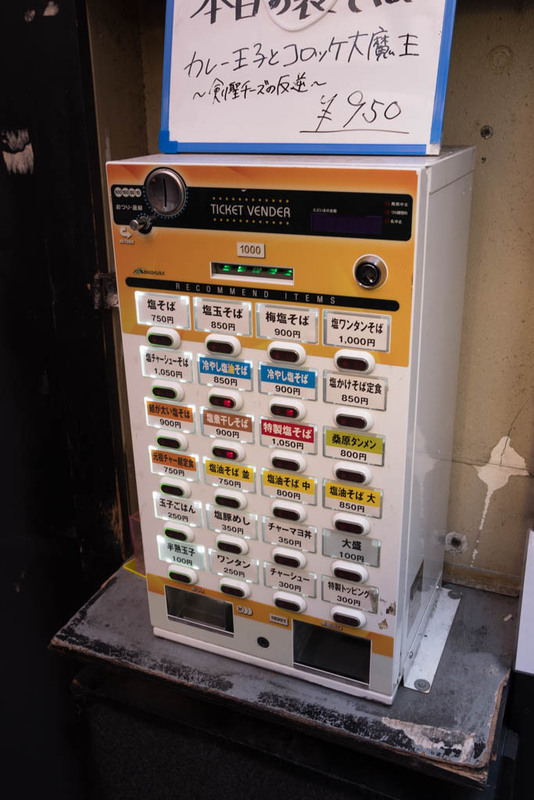 塩そば専門店. 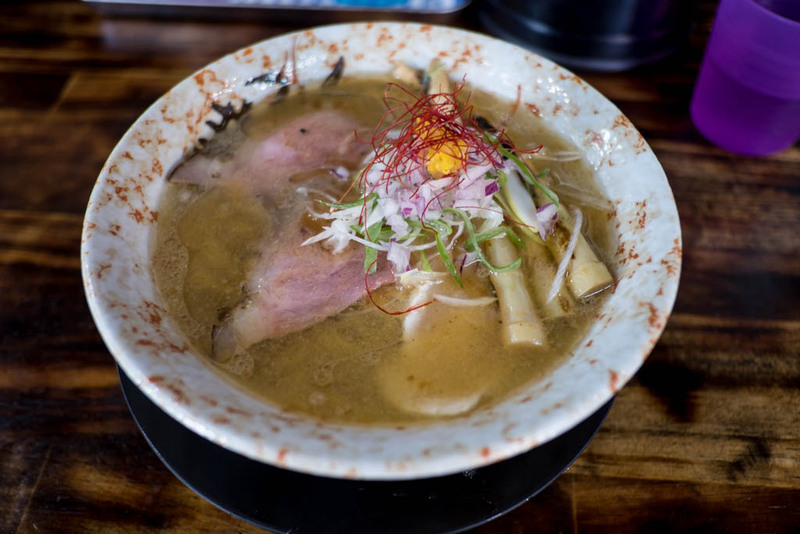 That means shio ramen and nothing else. Great! Actually, the list of choices is quite long. 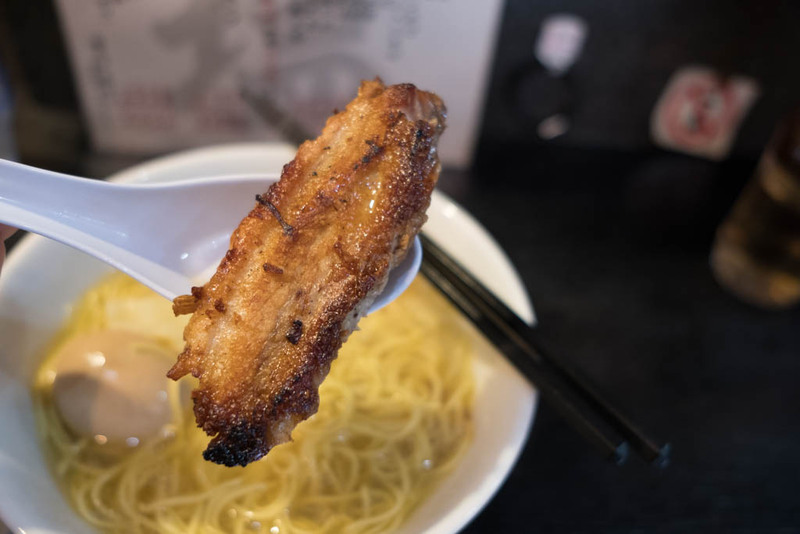 Ramen, cold ramen, soupless ramen, slaty fried pork over rice. As always, the upper left button gets you what you want. This shop is a bit of a shrine to the Yakult Swallows, the Japanese baseball team I am a fan of. Nice! I should have worn my Aikawa jersey (only 10 years old). 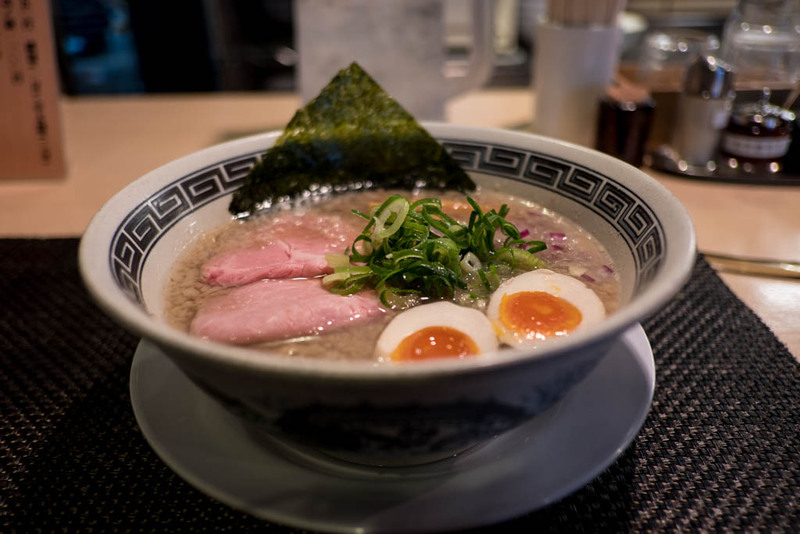 Salt ramen with an egg. The chashu here was excellent. It's thick cut and grilled up before serving. Nice and crispy. Kuwabara is in a bit of a ramen battle zone. With at least a dozen great shops within a few minutes, they have some stiff competition. What I love about these parts of town is that the best shops of each style rise to the top. 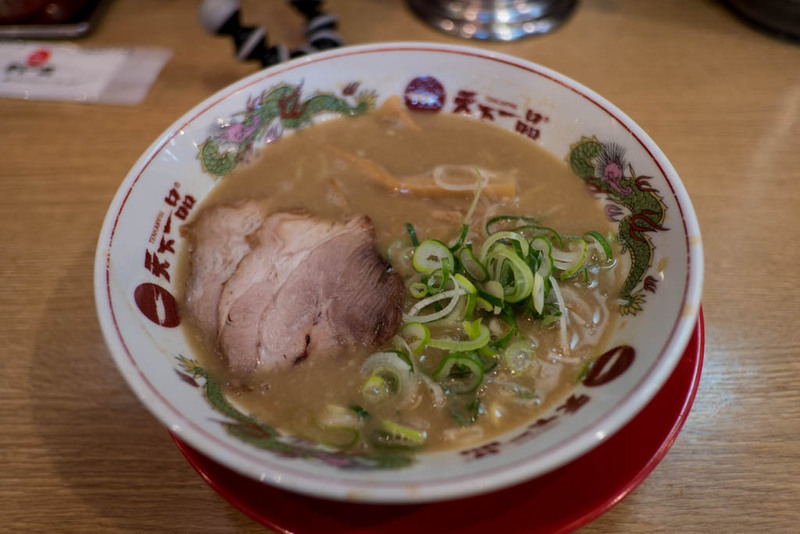 Of course, as I wrote that, I realized that another amazing shio ramen is just across the street; Ganko. Ok, forget what I said. This one gets a recommendation for sure. 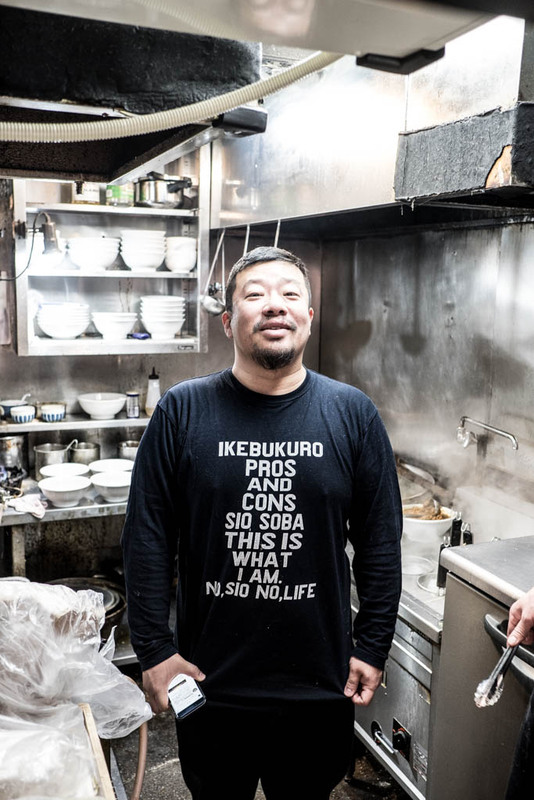 If not for the ramen, for the t-shirt situation. Seabura Kami. The god of back fat. 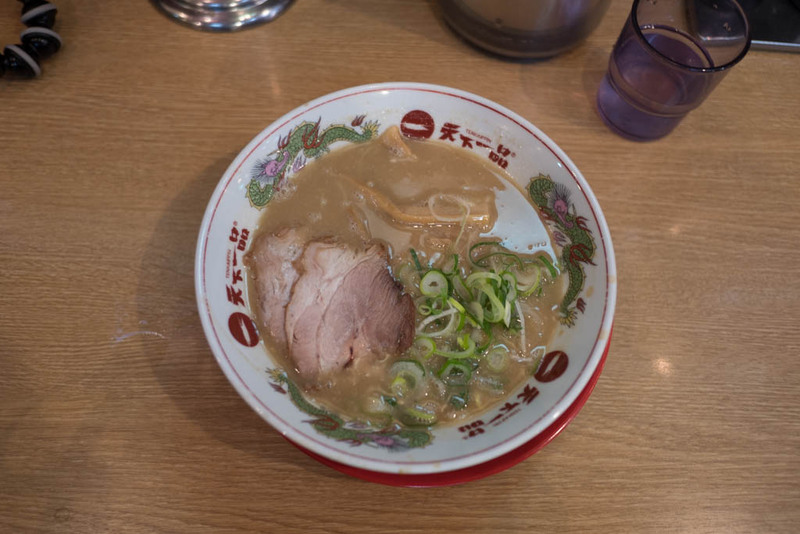 My plan in Kyoto was to finish strong at らぁ麺 とうひち, one of the area's most famous old school shops. 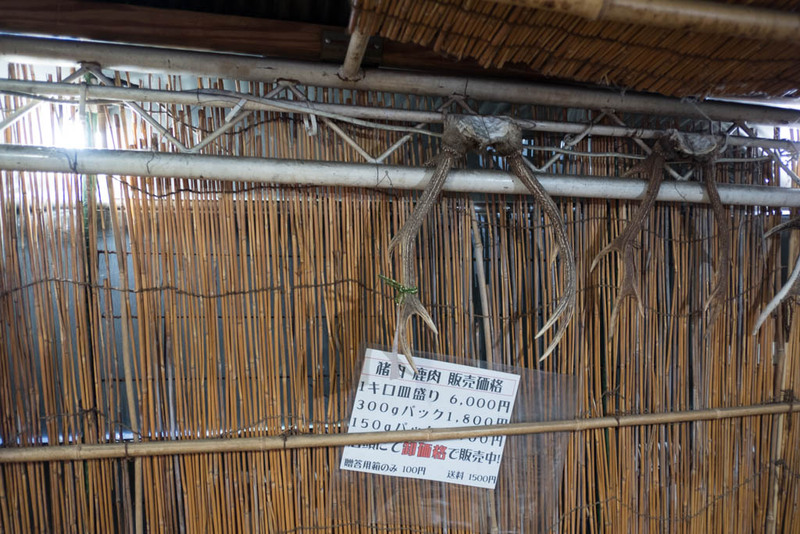 But Tohichi is way up on the northwest side of town, and I had a serious timing mishap involving a bicycle and getting lost in the mountains. Plan B, before my train back to Tokyo. 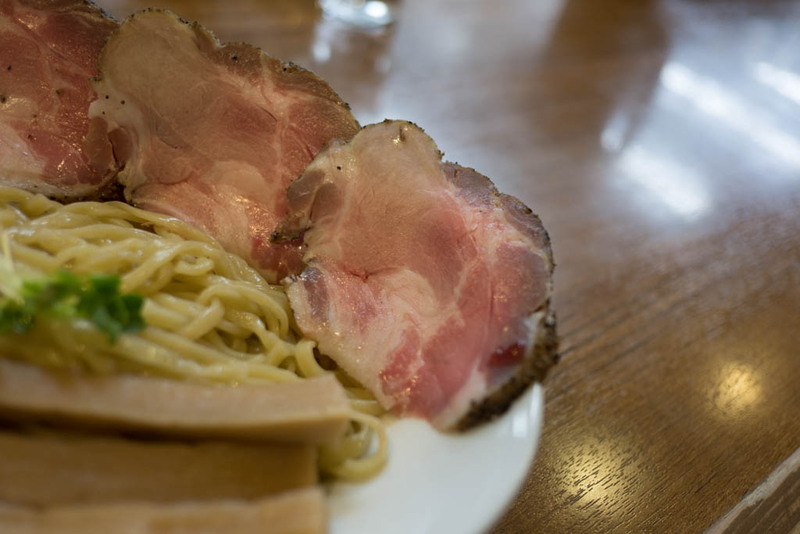 Seabura backfat is used commonly in ramen. 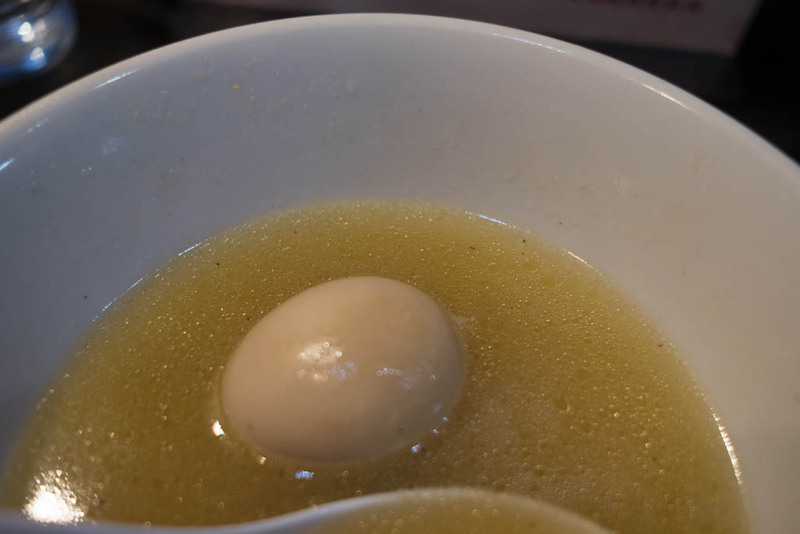 Thick globs of silky fat that basically melt in the bowl. Although the image looks chunky, it is smooth as butter. Probably more calories than butter as well. 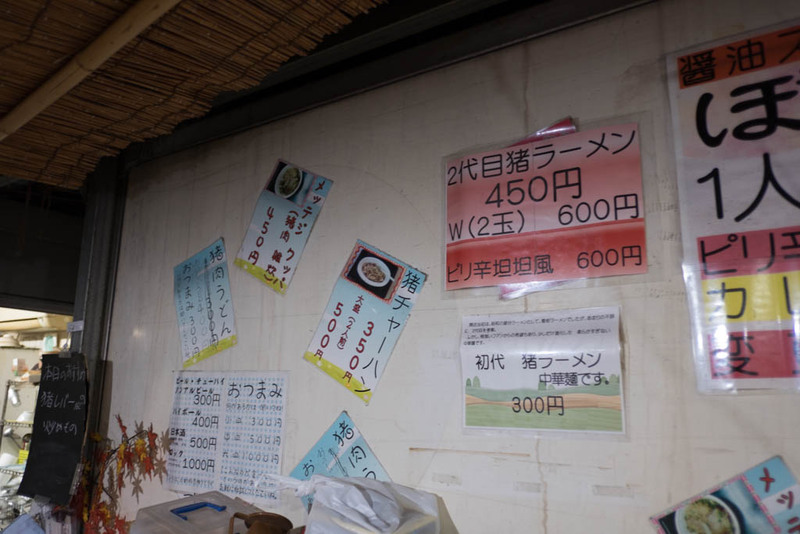 I associate seabura with Niigata ramen or Onomichi ramen, as well as some Tokyo shops like Hopeken. It's nice to see that there is a decent shop of this type everywhere you turn. I didn't take many photos at this one, focusing my attention on a YouTube video. Check it out! A little off topic, but I am now on Patreon. 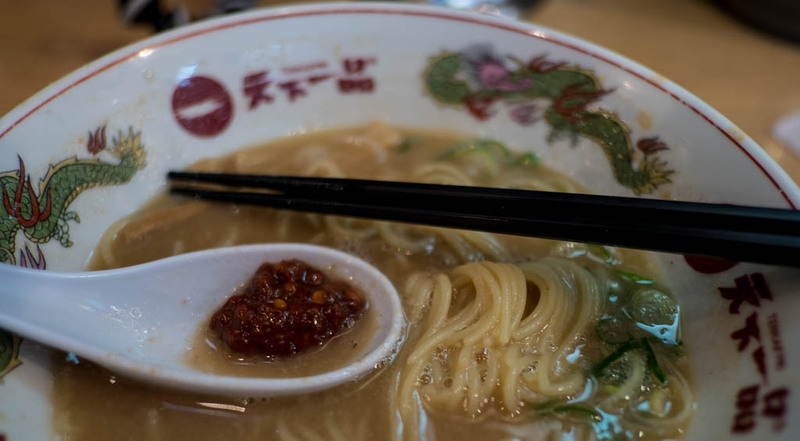 If you like my content, especially my videos, please consider supporting Ramen Adventures. The basic is just $1, and it really shows that I'm doing something meaningful with my time. 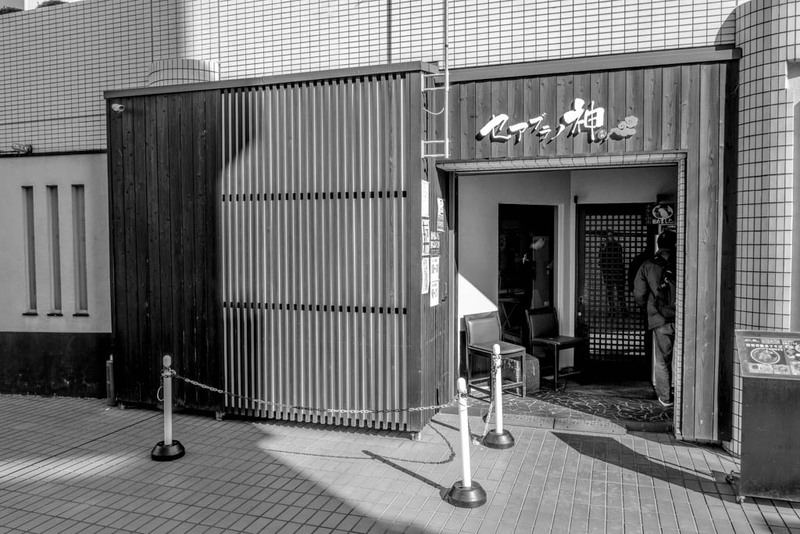 Hiro recently moved from a much busier location just west of the Kyoto Palace. Why the move? 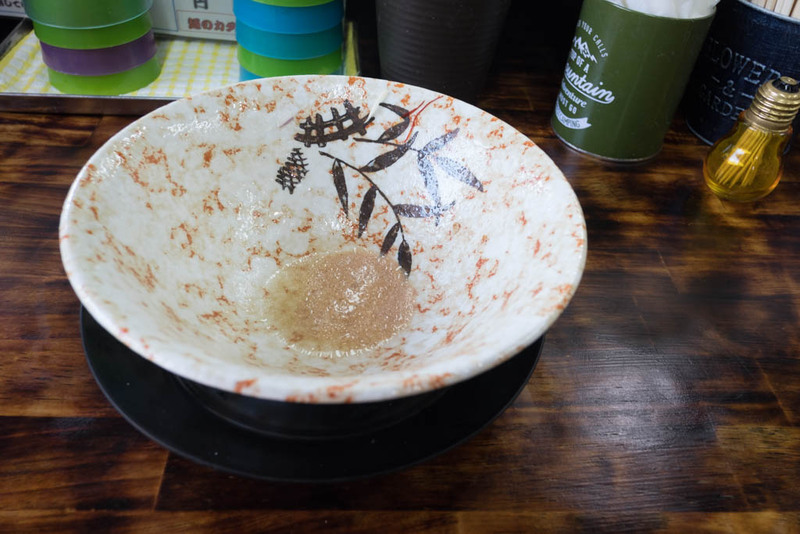 The master felt that, among other things, the shop was simply too busy, and a quieter part of Kyoto would better match his bowl. It isn't often that a shop truly blows me away. Sure, I have excellent ramen all the time, just not at this level. 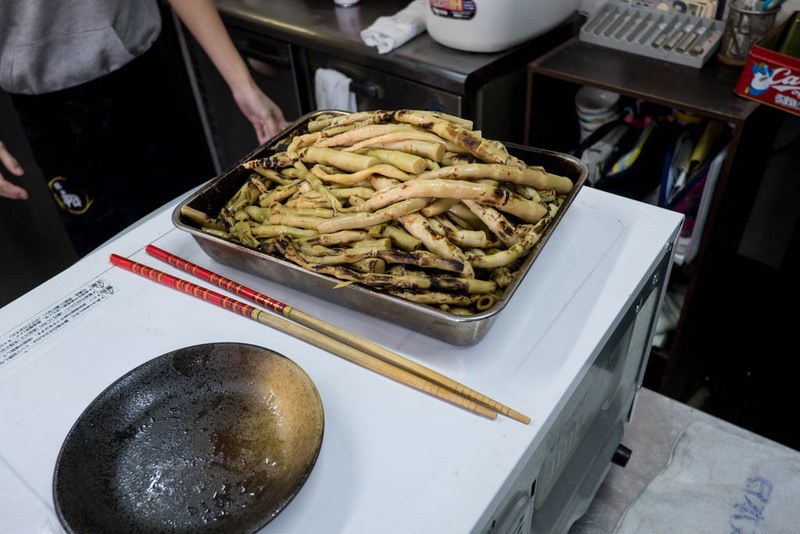 The vegetable above is 姫竹, literally princess bamboo. Tender baby shoots, lightly grilled and seasoned. 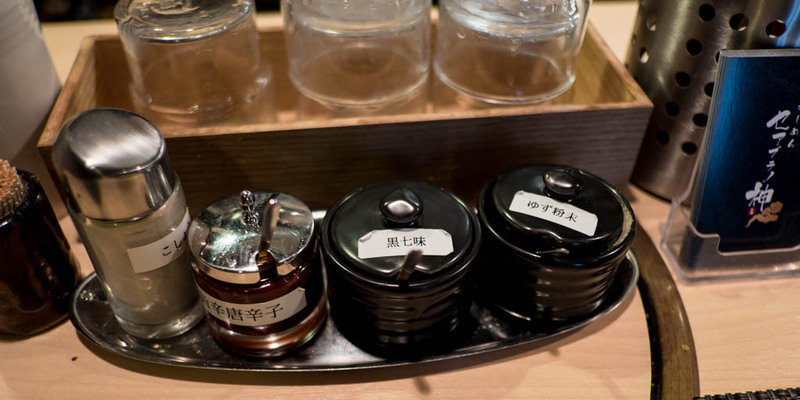 Most menma, or pickled bamboo, is re-hydrated stuff from China. This was on another level. 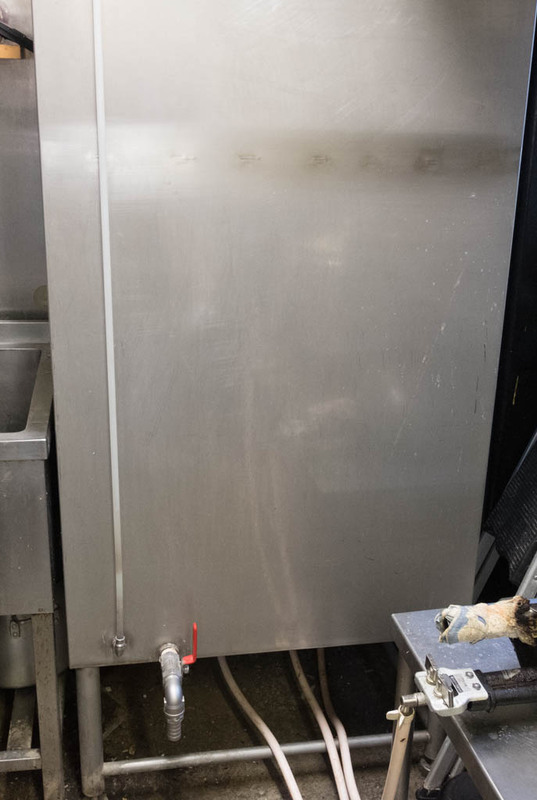 This massive metal container? A $10,000 water holder. Something about keeping ions out, or maybe keeping ions in. The master drives up to nearby Fushimi to stock up on spring water about once a week. The Fushima water in Japan is prized, often used in some of the country's most celebrated sake. He uses it for the soup, tare, and noodles. So, basically, everything. 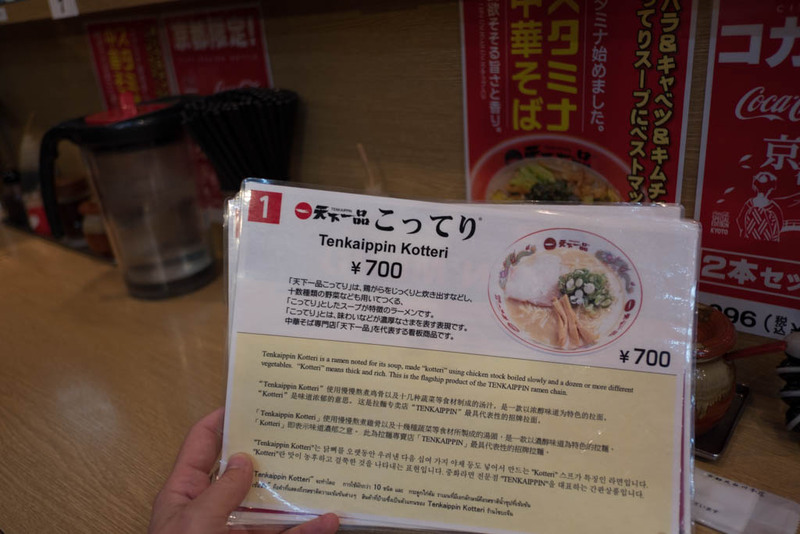 The most popular menu item is the 蟹塩そば, kanishosoba. Japanese blue crab meets local chicken for the base of this one. I'm not exaggerating when I say that this one is something special. It has a crab impact, with a subtle, meaty umami aftertaste. Watch the video to see how he makes his noodles. Spoiler, he uses an old hand crank pasta roller to cut them before boiling. 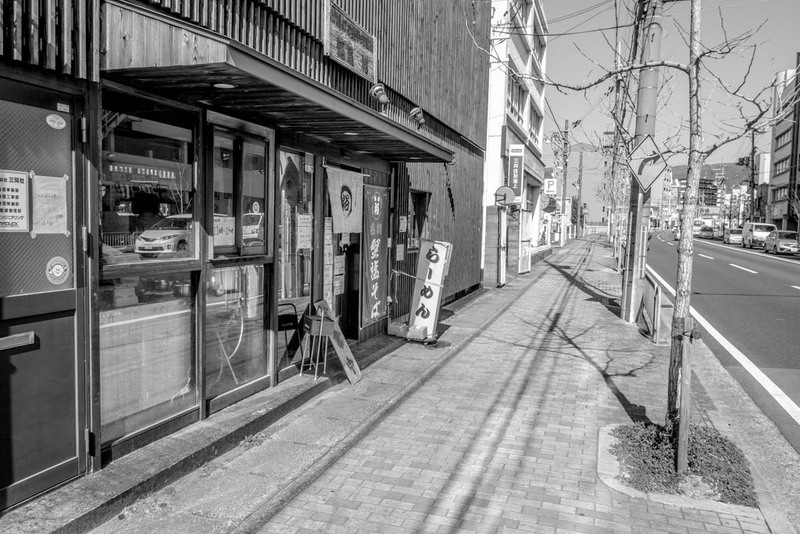 The fine folks at the amazing Anteroom Kyoto boutique hotel suggested this shop, about a minute from their front door. I highly recommend this hotel if you are on a budget and want somewhere that doesn't feel cheap. And the free bicycle rental is great. Kyoto (not the mountains!) is a wonderful town to visit by bicycle. This hotel was made in collaboration with Kohei Nawa's nearby studio, called Sandwich. 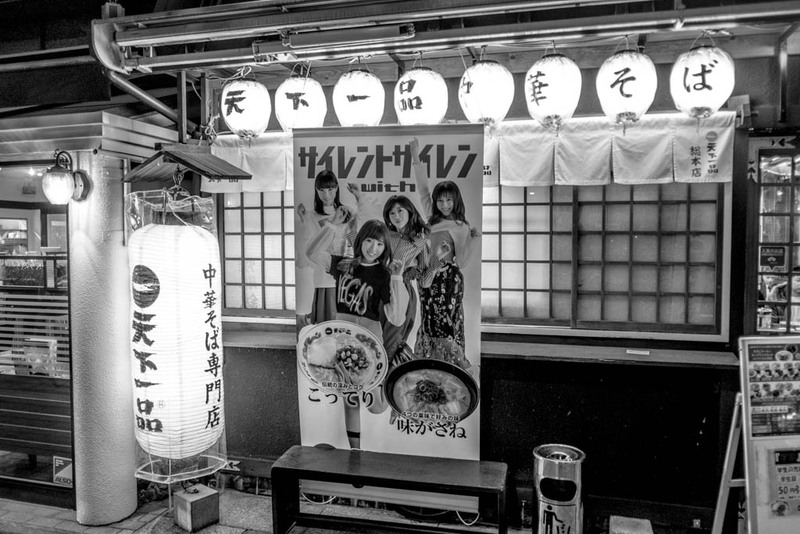 The hotel feature's said artist's work prominently, as well as up and comers in the Japanese art scene. 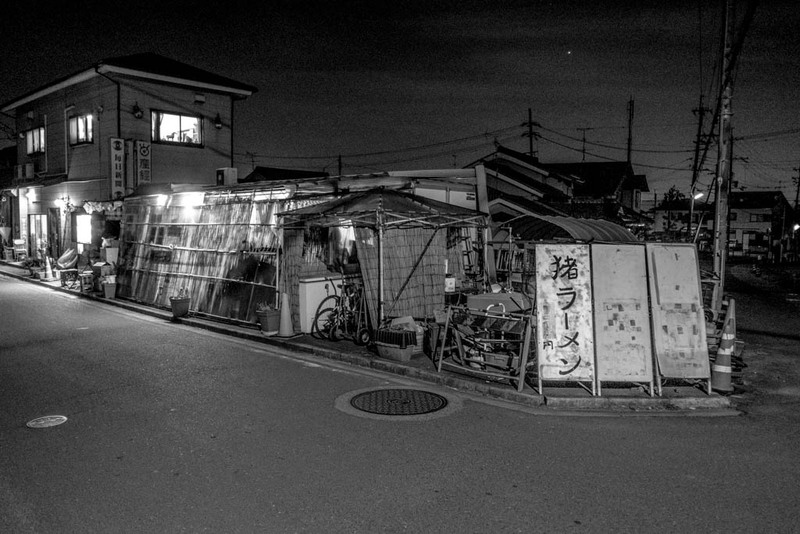 Actually, he is one of my favorite artists in Japan, and I go out of my way to visit anything he is connected to. 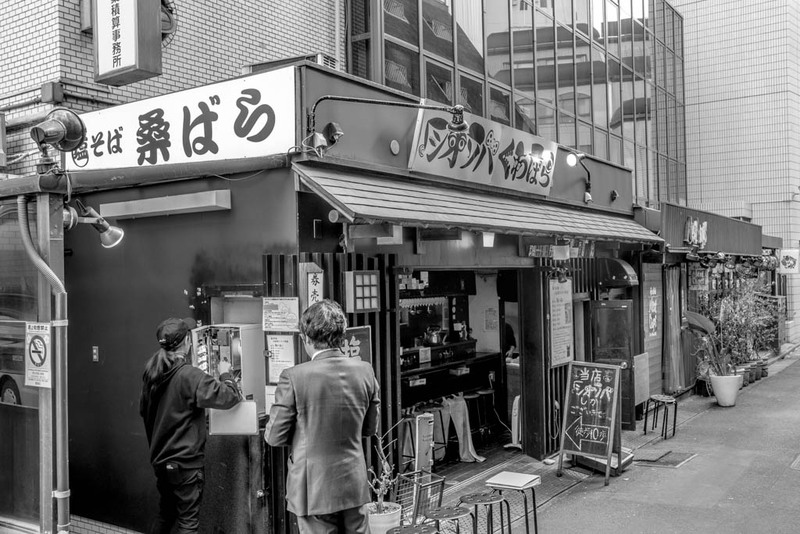 This shop is connected to the very popular Daiichi Asahi, near Kyoto Station. While the other shop has massive lines of tourists from Japan and abroad, here is a bit more subdued. You might wait for a seat, but probably not. 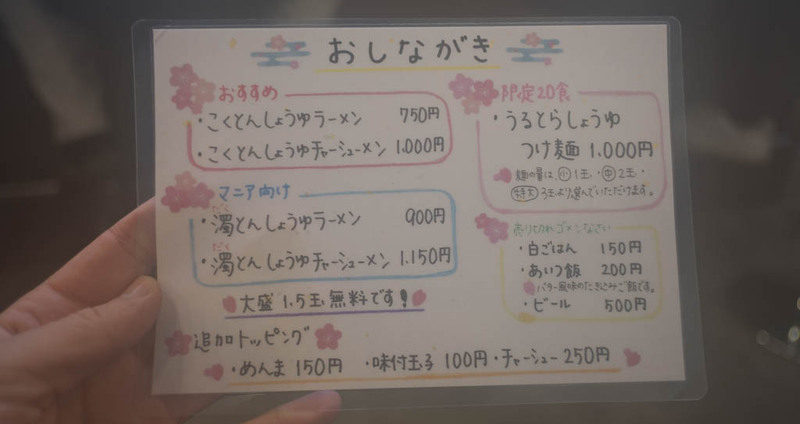 As for the menu, it is simple. 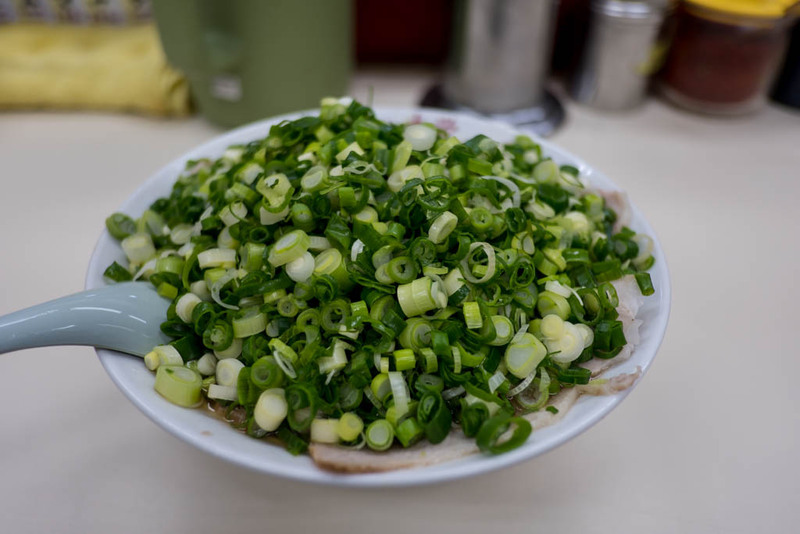 One bowl, with the choice of extra pork and extra local green onion. Although you may be inclined to get extra onions for the photo, be warned that it is truly a mountain of the stuff. 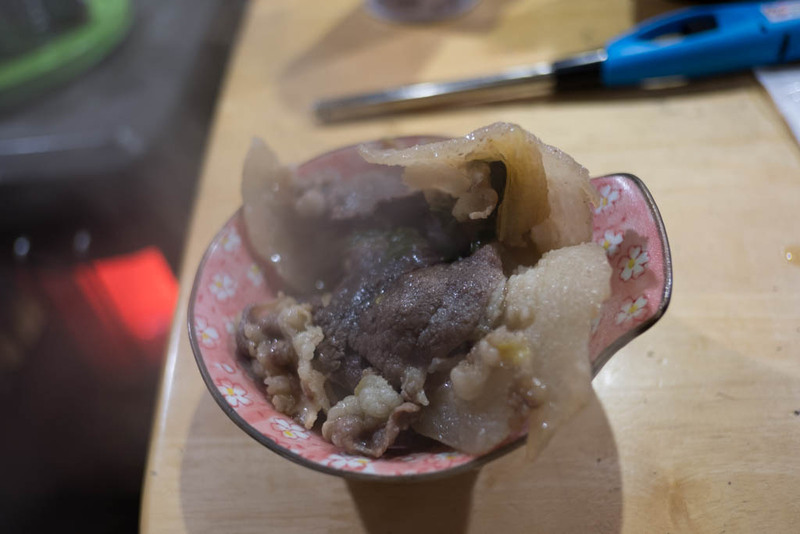 But as you eat, they soften and lend a bit of sweetness to the broth. Quite nice, but still a mountain. The extra pork is, as expected, another mountain. Go normal, or be prepared for a bit of scolding from the master. Well, I finally made it here, to Tenka Ippin. 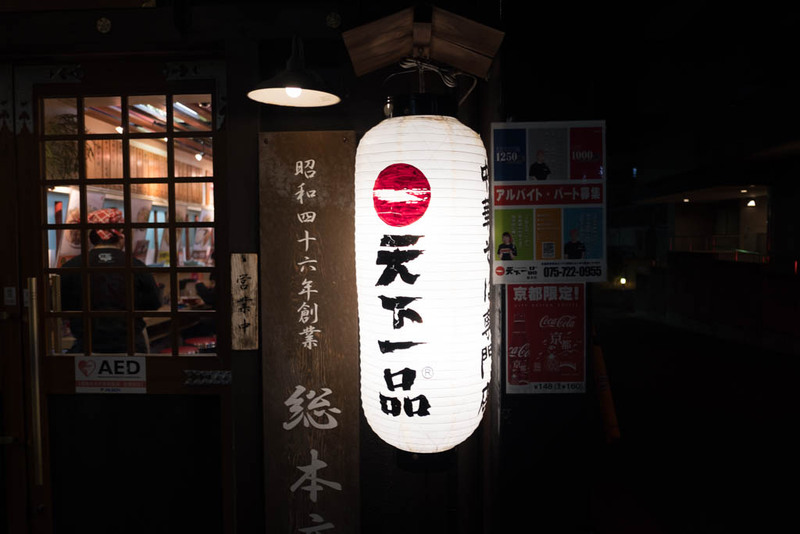 This was part of my hunt for great ramen in Kyoto, and I just had to pay a visit to this institution. 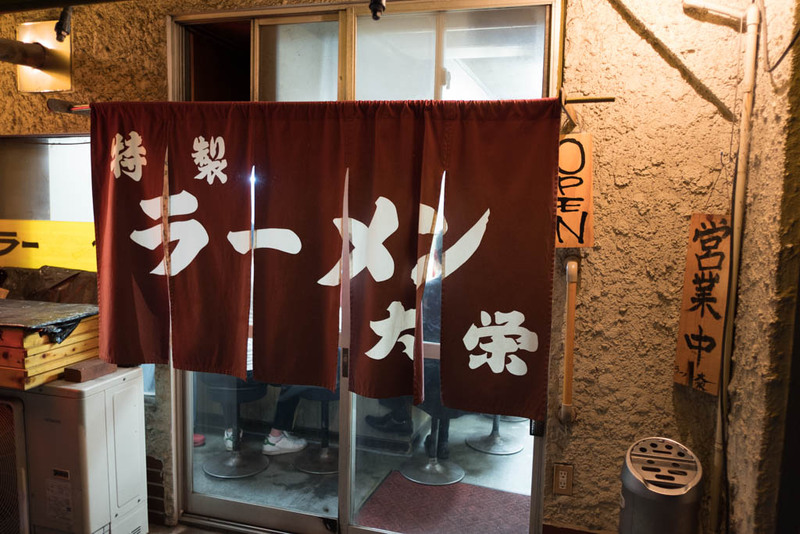 This is one of Japan's most famous chains of ramen shops. 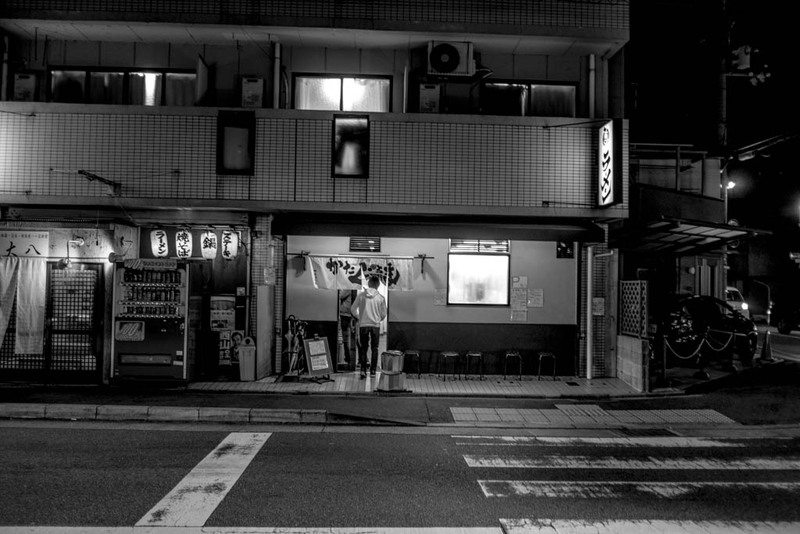 The first restaurant was opened in 1981 in Kyoto by Tsutomu Kimura. 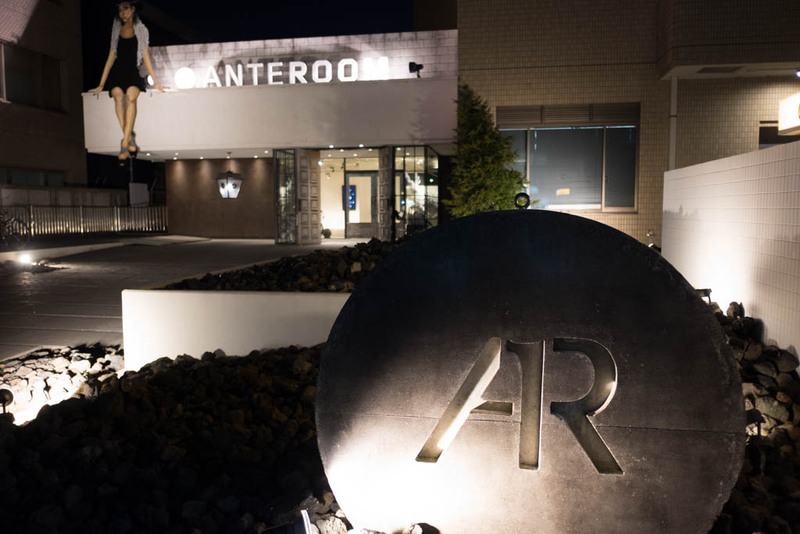 Since then it has been rapid expansion, and there are over 240 shops nationwide. 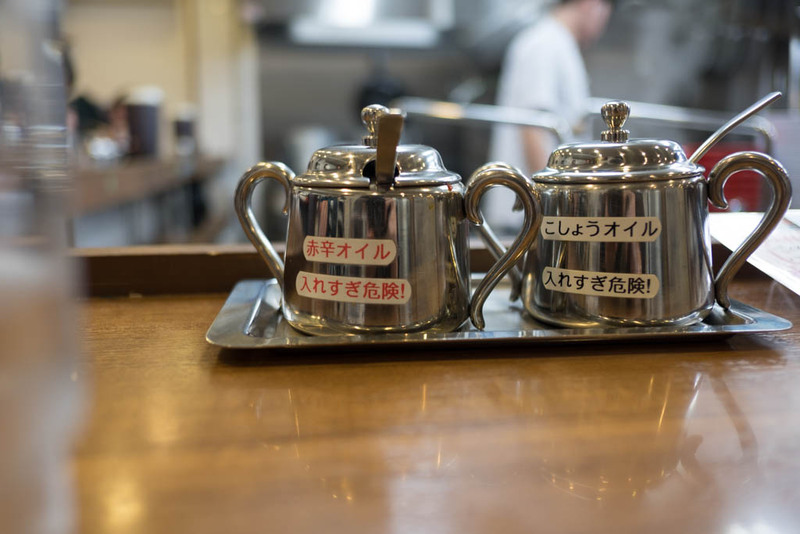 They serve a few styles, but the thick こってり is the one that most people swear by. Before I show the bowl, a quick story. Personally, I stay away from the chains. 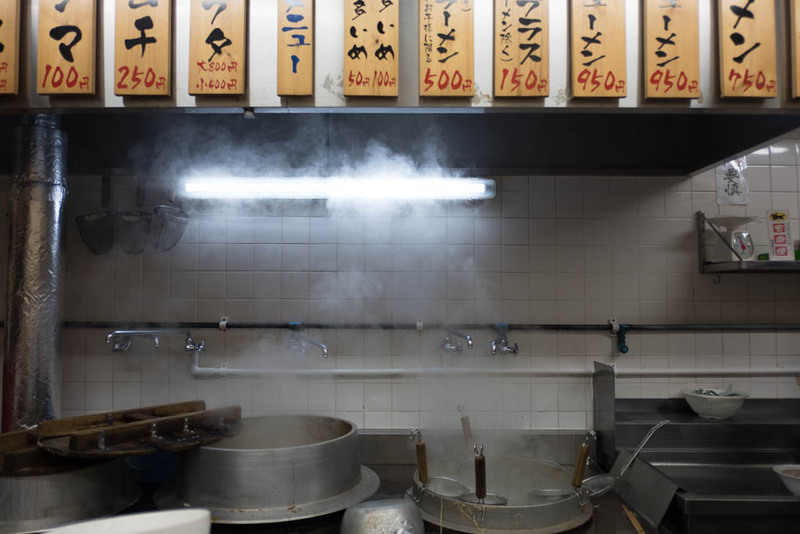 I have no problem with tasty food, but chain shops make their soup in a factory, ship it to the shops, and employ minimum wage students to serve it to you. 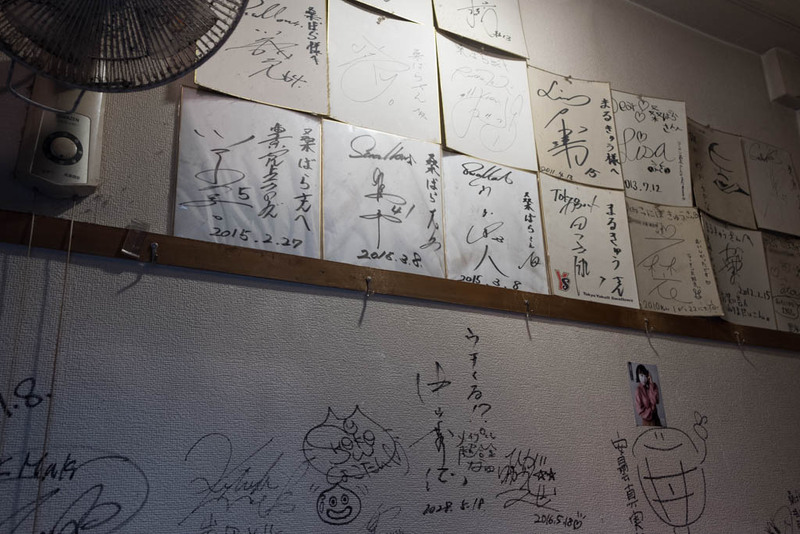 It's organized and consistent, but lacks the emotion and personal story that I look for in ramen shops. 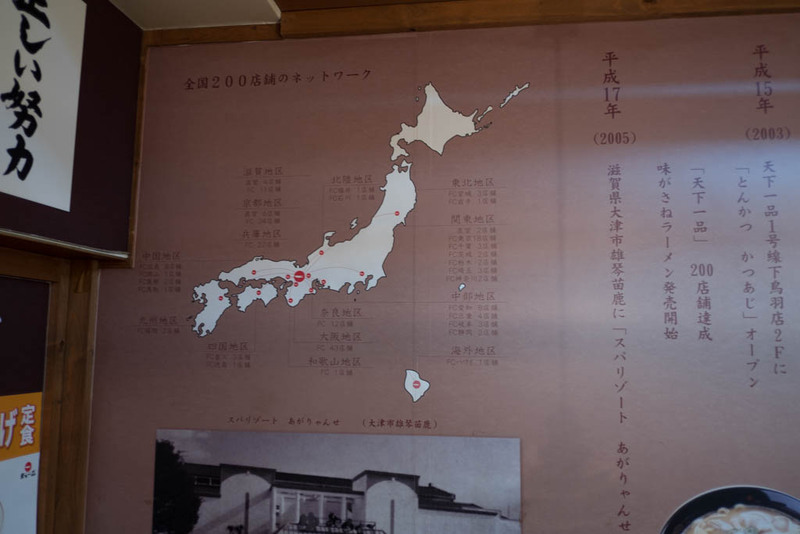 One time I was asked on a Japanese TV show about Tenka Ippin, and I said that I never went. 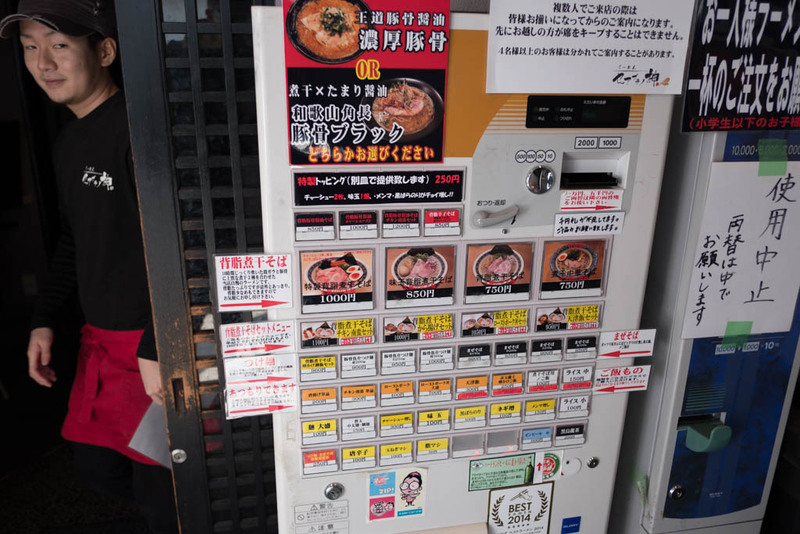 The next day, my mailbox was full with anonymous hate mail from Japanese people who said I had no right to speak about ramen if I didn't worship the ground that their beloved Ten-Ichi was built upon. 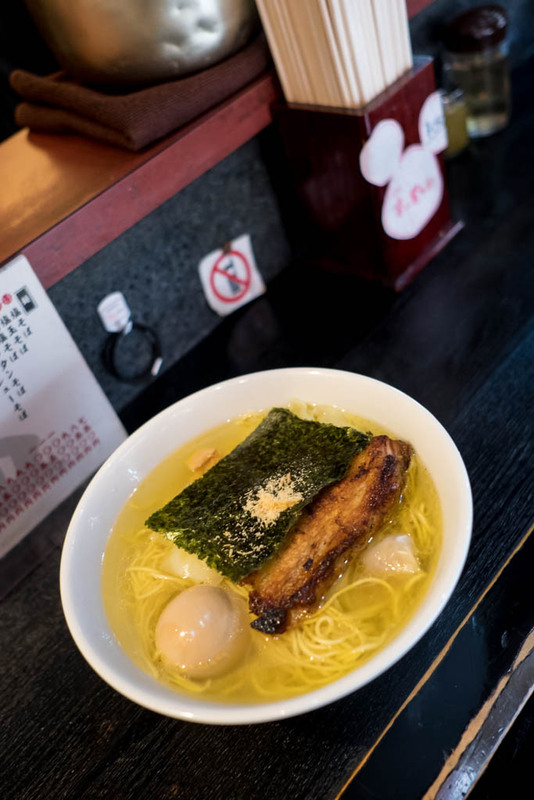 Anyways, this one is Kyoto-style, meaning a thick chicken soup with thin, Kyushu-style noodles. Think of it as East meets West, replacing creamy pork for creamy bird. It's actually, as the name こってり suggests, super thick. Great with a little added spice. 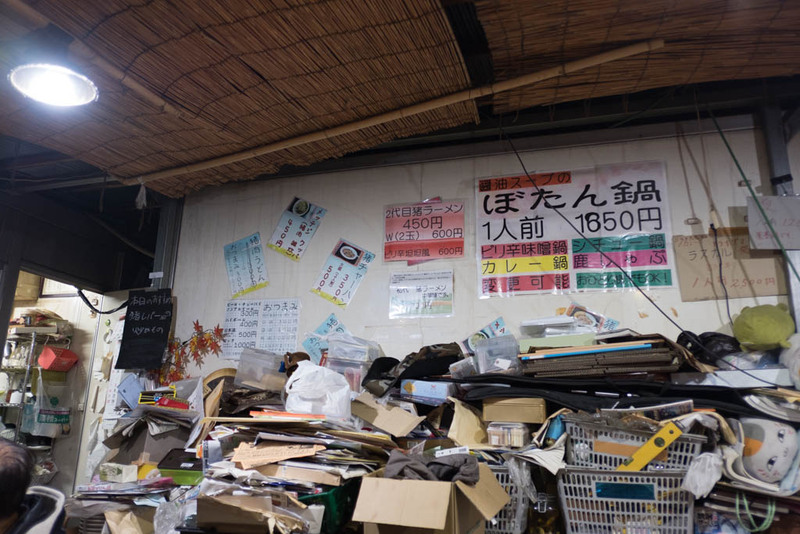 This is their original shop, so I felt it was part of my journey to come here. Will I visit other shops? Probably not. But I'd have no problem eating this again. Kata - 肩 - shoulder. 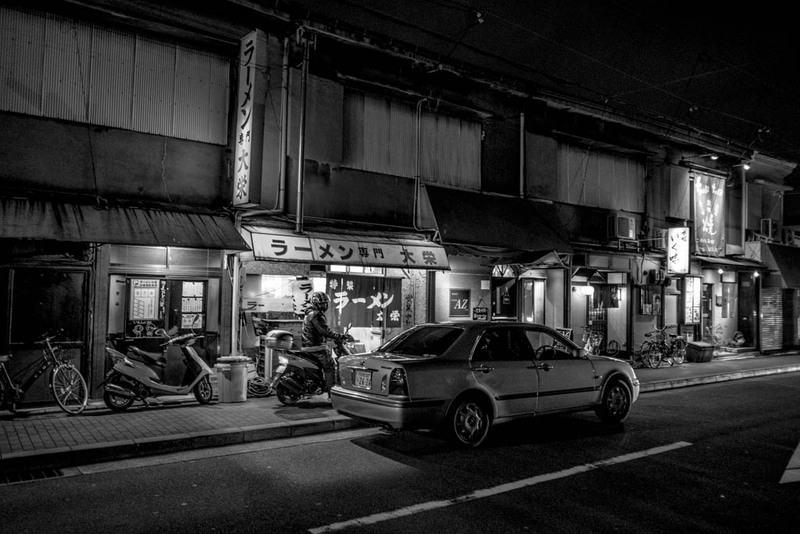 Kuruma - 車 - car. The Japanese word kataguruma, or shoulder car, means piggyback. It's a fitting name for a shop opened by the disciple of another famous shop. 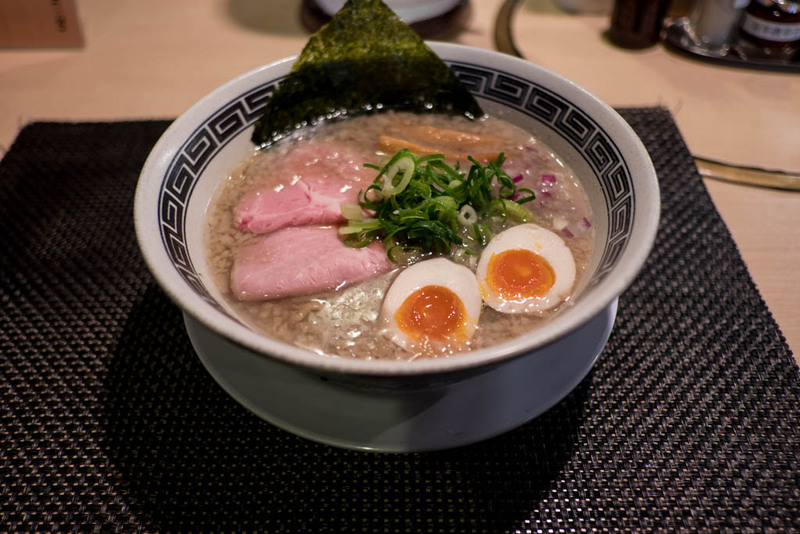 In this case, it's Orenoramenappare (俺のラーメンあっぱれ屋), also in Kyoto. But the original is not convenient by modern standards. It will take about an hour on public transport to get there. 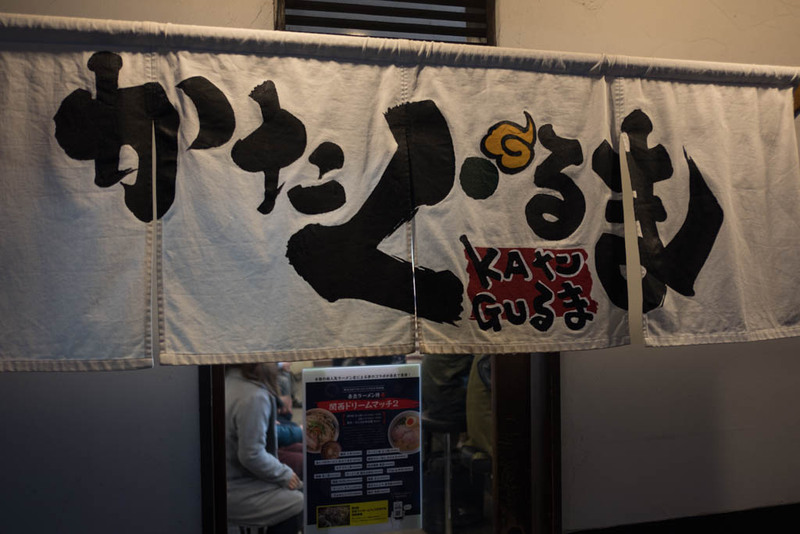 Kataguruma is just a couple stops from Kyoto Station proper. 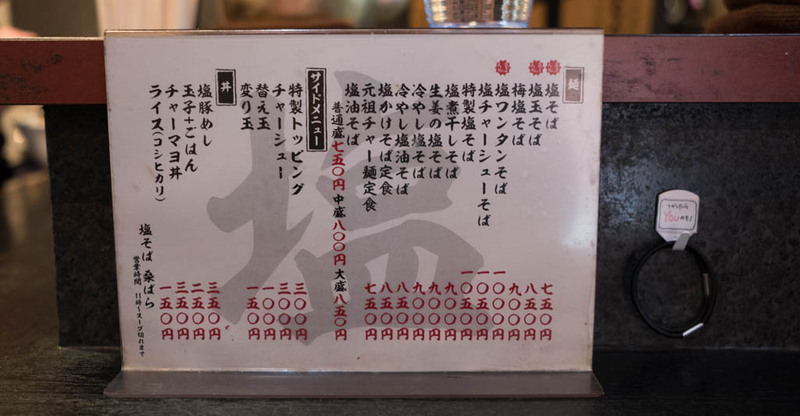 The menu is similar. 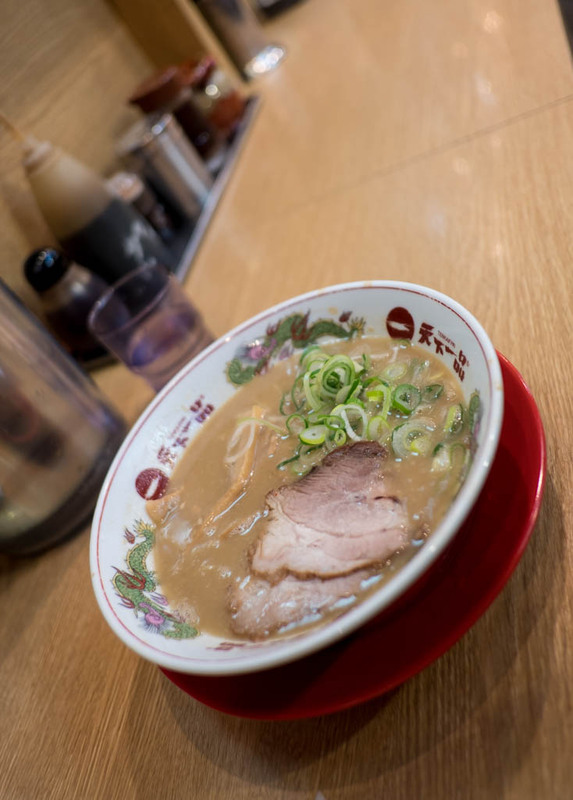 Tonkotsu shoyu ramen, thick or insanely (濁) thick. 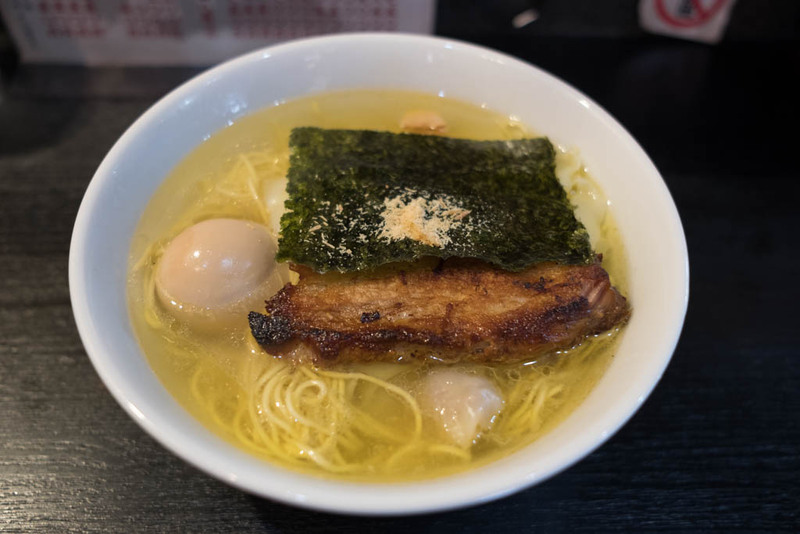 There is also a limited-to-twenty tsukemen. Let's try that. Homemade spice and pepper oils. 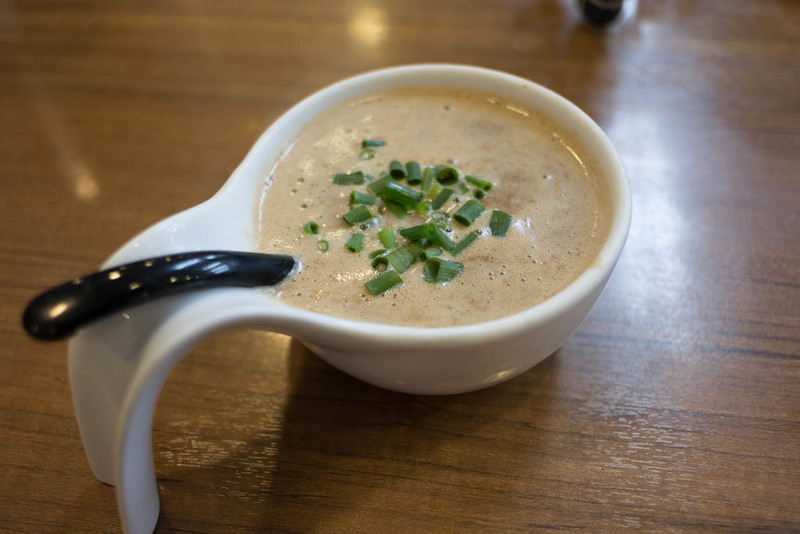 The soup is frothed up with a hand blender, aerating it and giving a bit more creaminess. The only sounds in the shop are slurps and the whizzing of this tool. 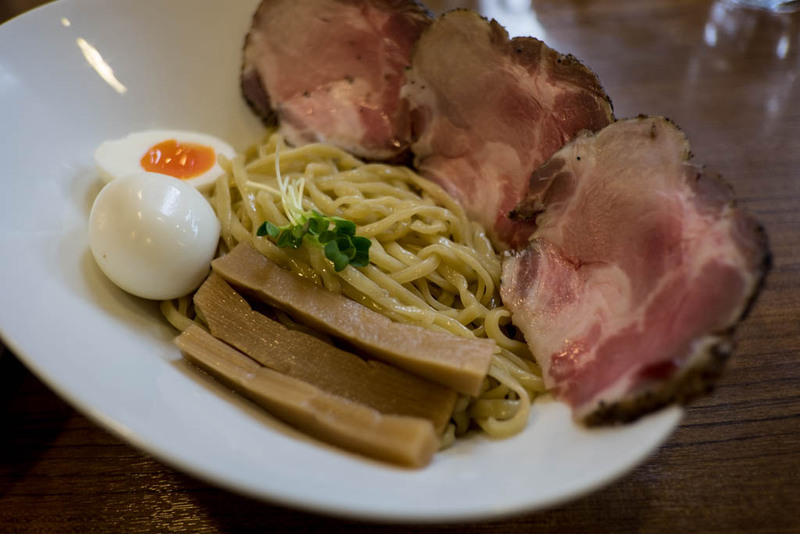 Peppered pork chashu, one of the shop's signature items. 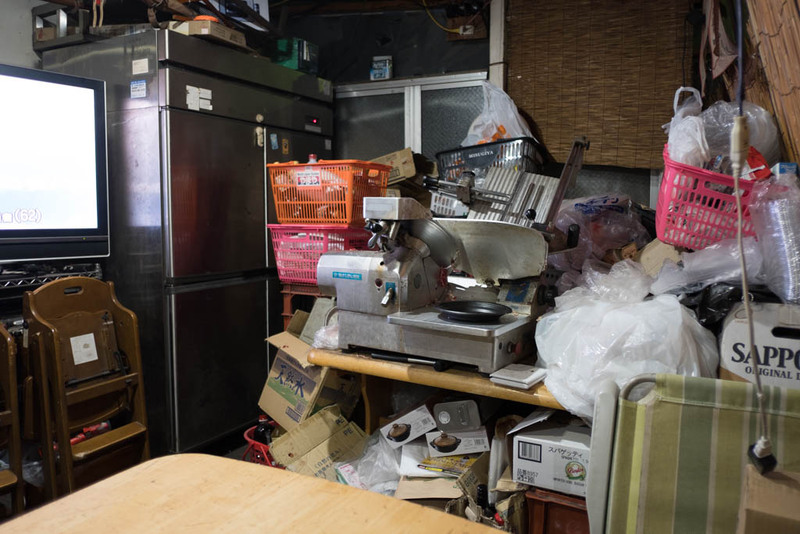 This, the original shop, is one of the country's most famous bowls, having received many awards in the past. A must-slurp in my opinion, at either the original or the second branch.